From 01/05/2019, the Devem de Mirapier will have a quadruple room, perfect for families or groups of friends! This room will be equipped with a double bed and 2 single beds. New look for our rooms! Soon a suite with Jacuzzi! 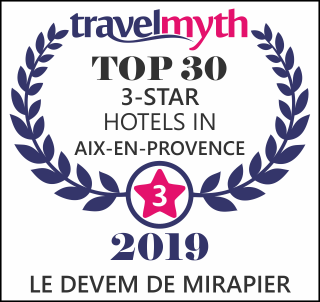 The 3-star hotel Le Devem de Mirapier welcomes you for business and leisure stays in a typically Provencal atmosphere, just a few minutes from Salon-de-Provence, close to Marseille Provence airport, Aix-En-Provence and the Designer Outlet of Miramas.